Learn more about our Wheelchair Obstacle Avoidance research. Watch a video (right-click and select "Save Link As..." to download and watch video) describing how the system works and demonstrating the system in action. Independence through self-guided mobility is an important part of maintaining a good quality of life. Older adults who require a wheelchair for mobility generally need a motorised, or powered, wheelchair as they are usually not strong enough to push themselves in a manually propelled one. However, operating a powered wheelchair requires good judgement and reflexes from the driver. Older adults with cognitive and/or fine motor impairments are not permitted to operate powered wheelchairs, as this would compromise the safety of the driver and those around them because of the resulting high risk of collisions with objects and people. This translates into a loss of of mobility for the older adult and an associated decline in quality of life. We are working to design a system for a powered wheelchair that detects obstacles in the path of a powered wheelchair and prevents collisions from occurring. One system being developed employs the Canesta 3D sensor, an infrared time-of-flight sensor, that is able to create a depth image by detecting the distance to objects in front of the sensor. The sensor is mounted to the front of the wheelchair and connected to a laptop computer, which processes the images from the sensor. A stop distance zone (shown in red in the Occupancy Grid in Figure 1) is set and any objects entering this zone as the wheelchair approaches them will cause the wheelchair to stop and prevent the driver from proceeding forwards. The system detects where there is the most free space (to the left or the right of the object) and provides the driver with an audio prompt to try moving to the left or right to clear the obsticle. 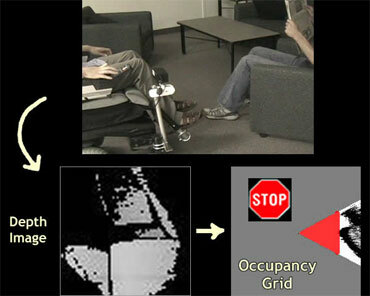 Figure 1: An example of the Depth Image and Occupancy Grid of a wheelchair stopping before it collides with a chair. Read more about the details of how the system works in this short paper. IATSL is the official grand prize winner in Canesta Inc.'s CanestaVision contest! The goal was to apply their 3-D, infrared sensor to a real-world application. Read more about the contest in the CanestaVision Contest Press release or visit the Canesta website. You can also view IATSL's award-winning video (right-click on link and choose "Save Link As..." to view video) and learn more about our Wheelchair Obstacle Avoidance research. Read article in the Univeristy of Toronto Press.